Visa and Samsung Agree to Enable Payment on NFC Embedded Chips; Deal Expected to Bypass Telcos | NFC Times – Near Field Communication and all contactless technology. Visa and Samsung have announced a deal that would preload a Visa payWave application in embedded secure elements in Samsung NFC phones. 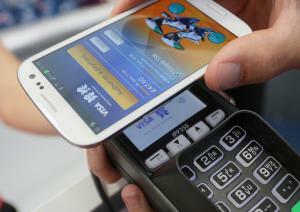 The companies had an earlier agreement to showcase NFC technology during the Summer Olympics. BARCELONA – Visa and Samsung Electronics have announced a landmark agreement that will see a Visa payWave application preloaded on the embedded secure elements in forthcoming NFC-enabled Samsung devices. As part of the deal, Samsung will allow banks to load their payment account information over-the-air to the secure chips, using Visa’s mobile provisioning service. Visa announced the agreement today at the Mobile World Congress in Barcelona. Article has about 1490 words.